Who is your hero? I'm not asking for the Sunday school class answer, but the person you most actively admire! 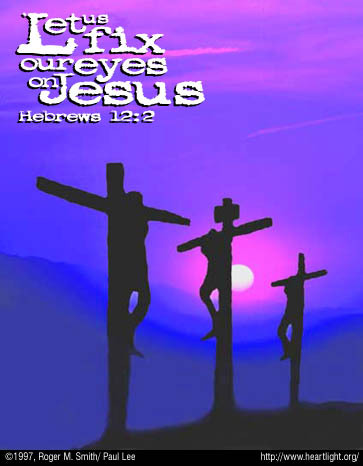 It is hard to "fix our eyes on Jesus" because he is not here where we can see him like other heroes. But he was the ultimate adventurer and trailblazer. He faced the horrific penalty and shame of the cross, taking away our sin! He did it so that we could have a hero that death and sin could not destroy, mar, or taint. He did it so that we could be confident that if we follow in his footsteps, the trail he blazed wasn't just for him, but for us, too! Holy God, forgive me when I chase what is false and let my focus shift from Jesus as my ultimate hero. I want to honor and serve him, having his life come alive in me, so that others may know the confidence that comes in having Jesus as their Lord. Words cannot express my gratitude to my Lord for his sacrifice and the horrible price he paid for my sins. Neither can words express my jubilation at his trailblazing victory that assures that I will someday be with you forever! It is in his name, Jesus Christ, that I pray. Amen.